web design dundee, website design Scotland, web designers Tayside Dundee. 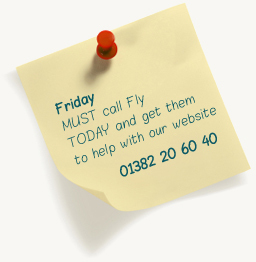 Fly On the Wire: Website design that works! Good for you! Actually it's very good for you because you have found Fly On the Wire. We're a web design and development company that care a great deal about what we do. We want to design you the best possible website that is great for your business and a pleasure for your users. Simple as that! web designers Tayside, web design scotland. Alles Klar ja? Fly On the Wire, Shed 26, Unit 35 City Quay, Dundee DD1 3JA.